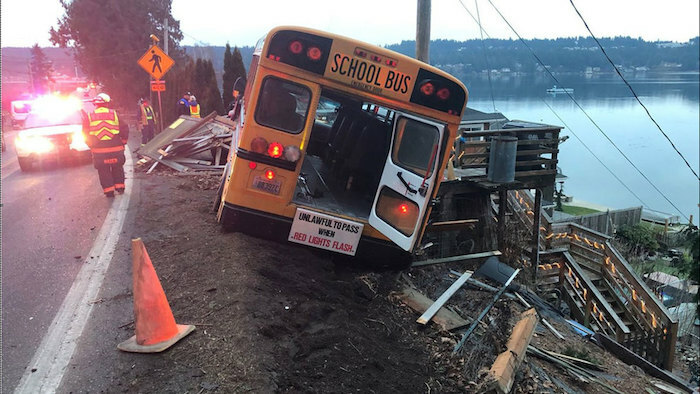 A school bus came dangerously close to falling off an embankment on State Route 302 on the Key Peninsula on Friday morning, according to the Washington State Patrol. Two students and the bus driver were aboard the Peninsula School District bus at the time. They were shaken up but luckily not injured. The incident occurred around 7:30 a.m. near Goldman Drive, about 10 miles north of Gig Harbor. Police say the bus driver swerved to avoid a large black animal that ran into the roadway. The bus crashed into a fence and two parked vehicles before coming to a stop on the edge of an embankment. Images from the crash scene show the bus leaning on the edge of a steep slope along Henderson Bay near the town of Wauna. Child Injured in a School Bus Accident? While the above school bus crash does not appear to have resulted in any major injuries, many times this type of accident does involve injuries. These incidents unfortunately do happen, and it is our wish that you and your child not face the legal complexities and stresses that happen after the accident. If your child has been involved in an accident of this nature, the attorneys at Seattle-based Davis Law Group can help. We handle cases across Washington state, helping victims and their families recover financial compensation in a variety of ways. Medical expenses. Children that are involved in a school bus crash are often left with minor to severe injuries and a lifetime of treatment. Those responsible for the accident should be compensated for these bills. Disability pay. If a school bus accident results in a lifelong injury, the at-fault party may be forced to pay for disability. Lost income. A parent that is caring for their child after an accident may be forced to miss work and their paycheck. That money can be recovered in the civil legal process. Special equipment. Children left with injuries may need medical equipment in order to recover. Pain. The injuries a child suffered in a school bus crash may not go away immediately. Mental anguish. The traumatic nature of a school bus crash — particularly for students at a young age — can be extremely tough. For a free case evaluation with an attorney at Davis Law Group, contact us today by calling (206) 727-4000, using the chat feature below or filling out the contact form on this page.